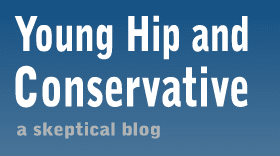 Young, Hip and Conservative: a skeptical blog: "Buy black" campaign makes the same errors as "buy local"
"Buy black" campaign makes the same errors as "buy local"
Now that 2009 has come and gone, there's one national story that stands out as something I should have written about. It's not the Gov. Rod Blagojevich of Illinois corruption crackdown, because a Democrat who hides his greed behind noble fables isn't news. It's not the far-right push to replace the Federal Reserve with the gold standard. History lesson - we had both during the Great Depression, and the Federal Reserve's big mistake was not following its own rules. This issue attracts more flies than anything else. It's not the Joe Wilson "you lie" outburst and its aftermath, because I covered that already, although I forgot to mention that if Wilson's point was that emergency rooms will still cover illegal immigrants because the Democrats took out measures to check for immigration status, then he was correct. No, the story I missed is the birth of a "buy black" campaign out of Chicago (Don't act all surprised - you read this entry's headline). John and Maggie Anderson started "The Empowerment Experiment" to drum up support for black businesses. The idea is they would only purchase from businesses owned by other black people to make the black community richer. "We're not advocating that anybody make purchases along racial lines. OK, that's not what we're advocating. What we are advocating, though, is that African-American do have a higher sense of duty to support black businesses that are investing in the community." Unfortunately, that's not what the campaign has been telling people to do. It really has been advising people to purchase from black-owned stores - regardless of what those businesses do with their profits. I'm aware there are some serious ethical concerns here, but that distracts us from an important question. People have been so hung up on race that they haven't been asking if this plan will actually help the black community. In a word, no. This is the same fallacy as the "buy local" movement, but instead of limiting purchases to the immediate area, participants are limiting their purchases along racial lines. Like the "buy local" movement, the "buy black" movement looks at the increase in business the merchants will undoubtedly receive and calls that a success. What they are forgetting is the difficulties the black customers will experience - higher prices, inconveniences and lack of choices - and all in the name of an aesthetic choice. The gains to the merchants will be smaller than the sacrifices paid by customer, due to lack of economics of scale and higher transaction costs. This campaign will make the overall black community poorer - not richer. "It's been two months since 2-year-old Cori pulled the gold stud from her left earlobe, and the piercing is threatening to close as her mother, Maggie Anderson, hunts for a replacement. It's not that the earring was all that rare—but finding the right store has become a quest of Quixotic proportions. Maggie and John Anderson of Chicago vowed four months ago that for one year, they would try to patronize only black-owned businesses. The "Empowerment Experiment" is the reason John had to suffer for hours with a stomach ache and Maggie no longer gets that brand-name lather when she washes her hair. A grocery trip is a 14-mile odyssey. 'We kind of enjoy the sacrifice because we get to make the point ... but I am going without stuff and I am frustrated on a daily basis,' Maggie Anderson said"
Unlike localalists, the Anderson's report they have to drive 20 minutes to get groceries even though they live in a big city. So in a way, it's worse. Localists at least have the convince of buying from stores in the immediate vicinity. Black-owned businesses can be spread out pretty far. This does, however, give black-only consumers the ability to buy things online and have things mailed in. Otherwise, the major economic errors are there. Broken window fallacy - check. Mercantilism - check. Protectionism - check. I don't see any of the hyper-nationalism of the buy local movement, but that's because the artificial lines on which stores to buy from are drawn in a different pattern. I also haven't seen any Luddite tenancies from the "buy black" crowd but there's no reason the philosophy can't embrace them. Since the year is up, it's reasonable to start expecting the results to pour in from The Empowerment Experiment. However, the web presence of the movement has been spotty. Their official web site hasn't been updated. Their Twitter account dropped off in July and their YouTube channel last put up a video in August. They have a fans page on Facebook, and I've seen Maggie Anderson post on the wall, but its content is limited to links for black businesses. Just like the "buy local" movement, a campaign that promised to make the entire group wealthier spiraled into a mere advertising scheme for its merchants. Now that it's 2010, I'm interested to see how the Andersons think their experiment went. However, as we've seen before with the "buy local" movement, it's very easy to call a campaign a success because of its fanfare when its original goals were never met.